Welcome to Halloween Express Chattanooga, TN! Looking forward to seeing you back on Gunbarrel in the same location! Halloween Express is proud to have been a part of the Chattanooga community for the past eight years. Find us on Gunbarrel Road in front of Walmart and next to Pepboys Auto Store. Whether you want to find the scariest masks, funniest costume or the creepiest prop Halloween Express is the place to stop this season. We look forward to serving you with the best selection of costumes, props, decorations and accessories! 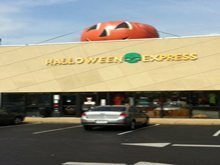 Halloween Express Clarksville, the Number 1 store in America, is back. The Giant Ghost Pumpkin has the greatest selection of costumes for grownups, kids, and even pets. With wigs, makeup, masks, a huge selection of accessories, not to mention a shoe department to knock your socks off (!) you can be whatever you want to be this Halloween. With our indoor and outdoor decorations, spooky music, and party supplies, your haunted house or Halloween bash can be just a bit spooky or a frightening scream fest. And for more Fall Family Fun, hit the Scooby Do Bounce House and Obstacle Course - one price gives you admission all day. Exit 4 off I-24, off Wilma Rudolph Blvd across from Panera Bread. 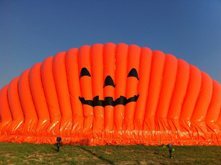 Come see us soon, cause the Big Smiling Pumpkin cannot wait to tell you Happy Halloween! Welcome to the Halloween Express of Franklin, TN! You won't find a larger selection of costumes, masks, props, decoration and accessories for this upcoming 2016 Halloween season. Look for the tent in The Cool Spring Galleria parking lot opening September 23, 2016. We are currently closed, but would like to wish our customers a fun filled summer! 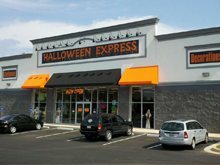 Halloween Express of Johnson City, TN is excited to return for another great Halloween season in 2016. We will once again offer you the best selection of costumes, decorations, masks and accessories. We look forward to serving you again soon in the Johnson City, TN area. You will be able to find us this Halloween in the Roan Centre beside the Carmike Theater! We have a killer selection and are dying to see you! 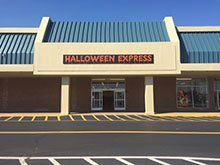 Welcome to Halloween Express Madison, TN! We will once again be proud to carry the largest selection of Halloween costumes and merchandise in the Madison area! For the 2016 Halloween season we will be located at the old Michaels on Gallatin Pike. We are currently closed, but watch for our grand opening late August. Welcome to Halloween Express Memphis, TN! We have a new location for this Halloween season. You will find us at 2269 North Germantown Pkwy #103 in Cordova in the Countrywood Crossing center. This is the same center where Ross and Gordman's are located and you can find us between Justice and Ulta Beauty. This is just 1 block south of the I-40/Germantown Pkwy exit 16A and 1 mile south of the Wolfchase Galleria Mall. 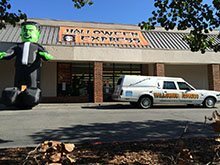 Whether you want to find the scariest masks, funniest costume or the creepiest prop Halloween Express in Memphis is the place to shop for the 2016 season. We look forward to serving you with the best selection of costumes, props, decorations and accessories!